Our Kickstarter Crowdfunding Campaign is LIVE! 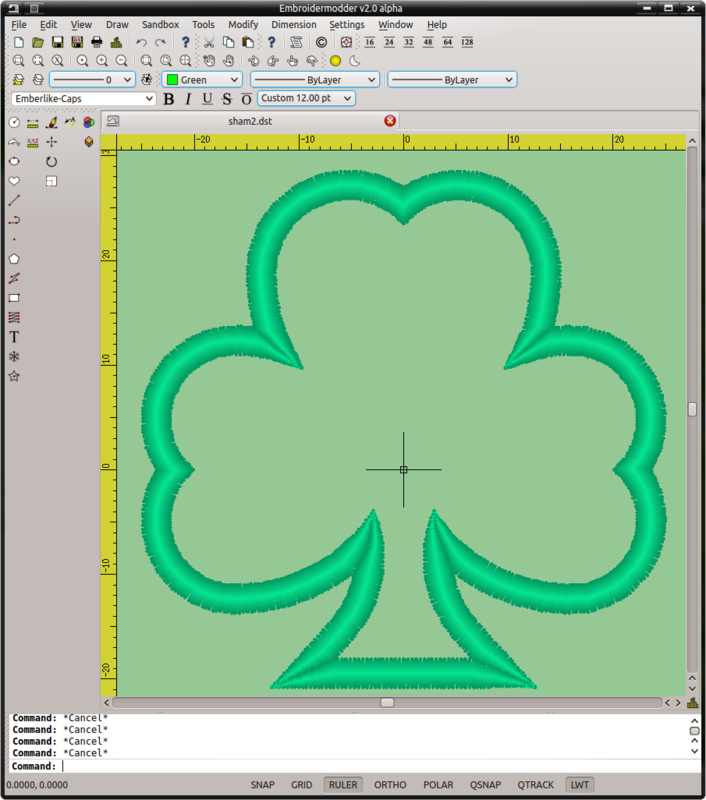 ... also check out our shamrockin' embroidery design created with Embroidermodder 2 using work-in-progress manual satin command! The launch of the Kickstarter campaign was delayed but is still going to happen. Unless there are other unforeseen setbacks, the revised plan is to launch our campaign on March 17. We have started setup of a nightly build/continuous integration system using Travis-CI. This is important as it will allow quicker bug fixes and increased stability long term. Currently this is only available for 64-bit Linux builds but will eventually include OSX, Windows and Arduino. We have also improved the stability and improved the API of our backend library: libembroidery. The API is still changing but we now can produce standalone static and shared versions of libembroidery. Another notable change is that there are now experimental Delphi and Lazarus(FreePascal) bindings in the works for libembroidery, contributed by x2nie. Last but not least, I have a demonstration of our libembroidery code embedded on an Arduino. The video below simulates the stitching by drawing it to a 2.8" TFT display (v1) made by Adafruit. It's really fast so I slowed it down for the video. Instead of drawing, we could change it to control motors and other hardware to create an open source embroidery machine. This is what the brain of an embroidery machine looks like and it just needs a heart and body. Enjoy the video! There has been a considerable amount of development time put into Embroidermodder 2 over the past several months. To be able to keep up this momentum, there needs to be at least one full time developer working on it. We are planning on launching a Kickstarter campaign in early October if everything goes according to plan. We also plan to release an alpha version during this timeframe, so there are many good things on the horizon! Successful funding will have a major impact on how soon the final version will be released. The preview link to our campaign is here, feel free to leave feedback and spread the word via Twitter, Facebook, email, or word of mouth. Keep an eye out, because it's coming! The Embroidermodder website now has a fresh new look. The content has been updated to reflect the upcoming version, Embroidermodder 2. Check out our features page for a summary of what to expect with Embroidermodder 2. The background is a tiled image of an actual design that was stitched out during the pre-alpha stage. It was created by Nina Paley and Theodore Gray using Mathematica in conjunction with our software. They have graciously allowed us to use it for the project in whichever way we wish. 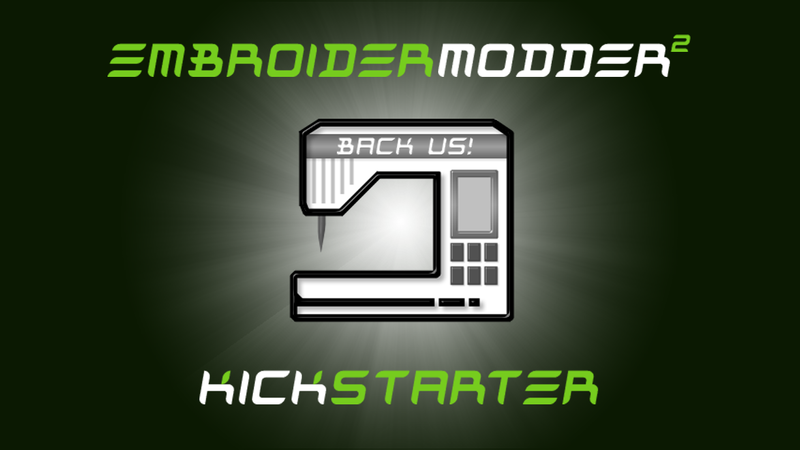 We thought it looked so good, that it has become the new theme for Embroidermodder 2. To check out some of the more interesting embroidery projects they are working on, look here. The old website which was for Embroidermodder 1 has been preserved and can be found here for anyone interested.